Me oh my. Growing up, my mom loved to make Mulligan Stew. I truly detested that stuff. Not sure why…it just didn’t flip my switch I guess. As a result, I rejected stew for many years. Of course, as we grow up, thankfully our tastes change and we expand our palette. Now, before you read the ingredients list for this recipe, let me go on ahead and tell you…this recipe calls for turnips. Go on…ewww…gag…gross…I don’t eat those. Trust Cajun Mama, you will eat them in this stew. Unless you are allergic to them…then I don’t know what to tell you. They give this stew a sweet flavor that is unlike any other and this stew is absolutely perfect. I promise. Big Daddy loves him some turnips. Remember he is country as all get out. His theory is…”if there are turnips in it, I know I am gonna like it”. He LOVES turnips. He wants to grow turnips in his garden. So, when I came across this recipe, I figured I would give it a try, knowing he would love it. Oh he loved it alright. And so did I. It is one of my favorite dishes to make during the winter. I really hope you won’t let your dislike of turnips turn you away. It is almost like they are potatoes in this recipe. So flipping good. Perfection in a pot I tell you. Salt and pepper your stew meat. Heat olive oil in a dutch oven or heavy pot over medium high heat. Add your pat of butter and let it melt. 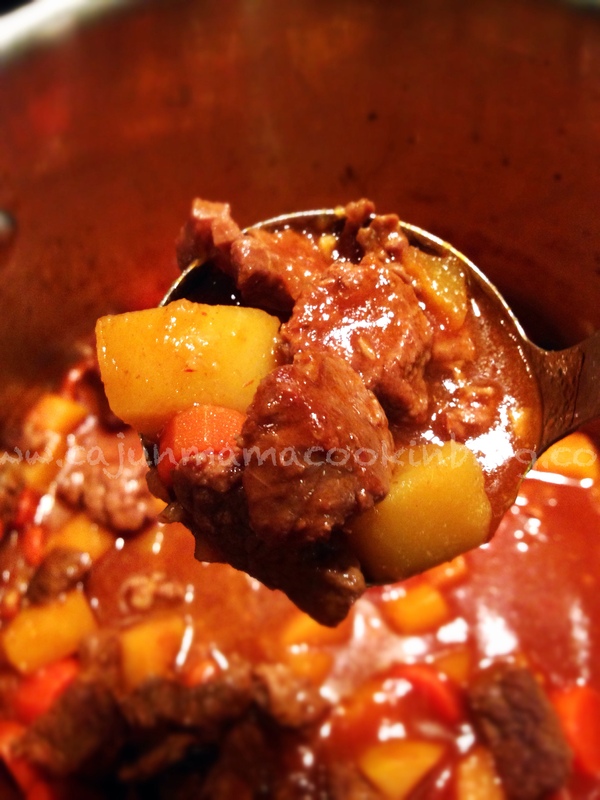 When it is melted, put add half of your stew meat to the pot. Brown it until the outside get nice and brown or about 2 minutes or so. Make sure you stir it to turn as it browns. Once it is nicely browned, remove it from the pot with a slotted spoon and put it on a plate. Do the same thing with the other half. Remove from the pot and set aside. Now, add the onion and garlic to the pot. Stir to coat in all the brown bits in the bottom of the pot…my daddy calls that the gremille. Cook for about 2 minutes, then stir in the tomato paste. Stirring constantly, let this cook for another 2 minutes or so. Pour in your beef stock, stirring constantly. Add a few dashes or splashes of Worcestershire and sprinkle in the sugar. Give it a nice stir to let all the flavors combine. Now, add the beef back to the pot. Cover and reduce the heat to low. Simmer for 1 1/2 to 2 hours. After the time is up,stir in the diced carrots and turnips to the simmering stew. Let this simmer for about 30 more minutes. The sauce will be rather thick, but if you think it is too thick, you can add a little more broth or stock until it is thin enough for your liking. Once the turnips and carrots are fork tender, you can add some parsley if you like. I do this once I serve the stew in bowls. My kids tend to ask “Ewww what is that green stuff?! !” and the inspections begin. So I try to not raise any red flags early on. Sigh. Anyway, ladle some of this absolute utter deliciousness into bowls over mashed potatoes (how I like it) or cooked rice (how Big Daddy likes it…yes, we are a couple divided…again…sigh). If you make up a pan of cornbread, you will be golden and loved forever. You will be hailed as queen of your castle and you will get a crown. Oh wait, no, that was a dream I had. Never the less, this is a WONDERFUL meal, especially on a cold windy and rainy day. Hope you love this recipe as much as we do in Cajun Mama’s kitchen. Cest bon ma chere!! Joyeaux Noel! Thank you for being a part of this journey so far. You are a blessing to me!! !